I purchased these recently from Stanley through Amazon. They were on sale for around $95 for the set of (4) with the leather tool wrap. I think normally they retail for around $119 or $129. 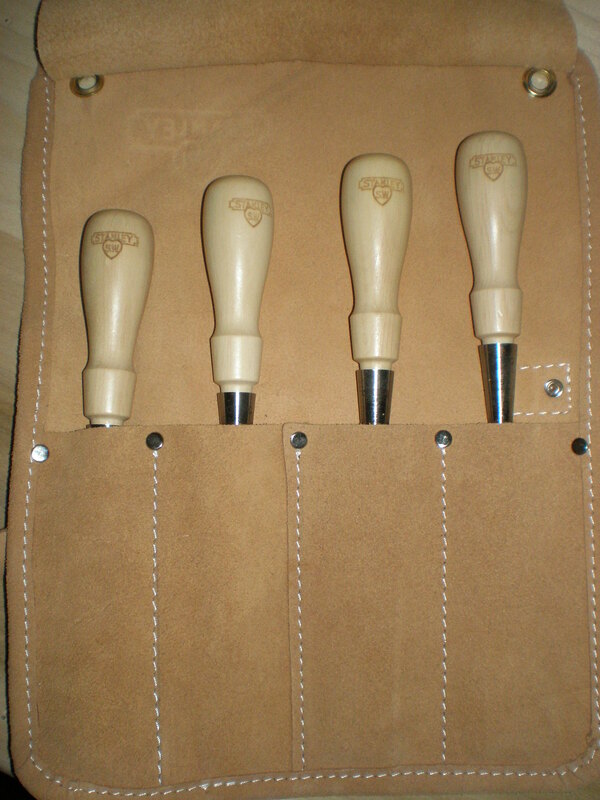 The set of (4) includes 1/4″, 1/2″, 3/4″, and 1″ chisels plus the leather tool wrap. 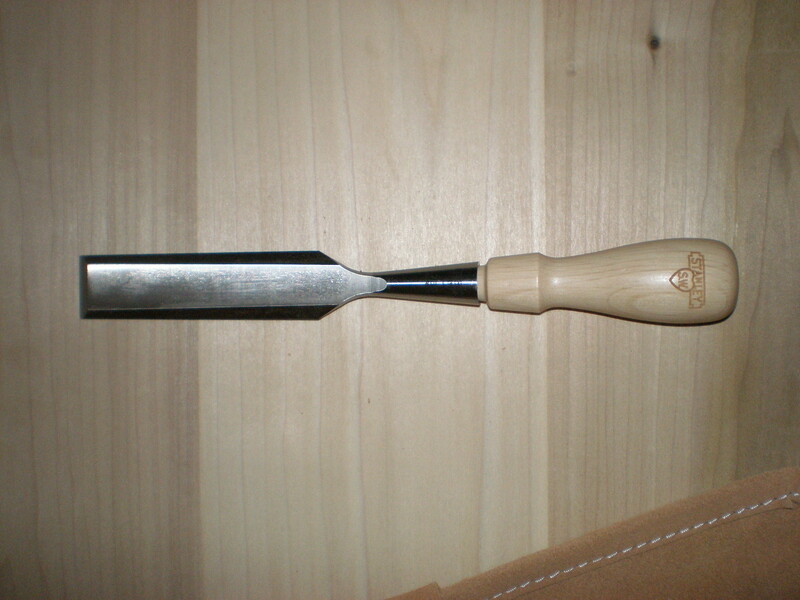 I originally had my heart set on some chisels from Lie-Nielsen, but a few things changed my mind. First was the great deal…you can only buy (2) of the Lie-Nielsen’s for this price. Second, the reviews had been really good. Third, the Lie Nielsen’s are based off of the Stanley original 750 series. The packaging was great…a box within a box, within a box. Each chisel was individually wrapped to protect the chisel from shipping damage. All four arrived in pristine condition. Right out of the box, these chisels were flawless…and razor sharp. From what I could tell these were manufactured in England with great skill. I have never seen a blade this sharp…even plane blades that arrived from Lie-Nielsen that are ready to go out of the box. 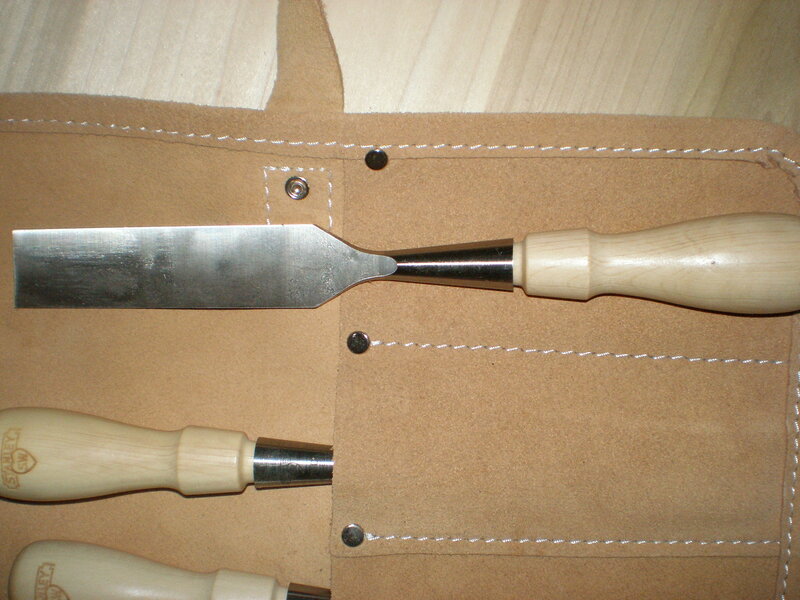 The leather tool wrap is nice, and holds the chisels well. I already had a leather wrap for a set of chisels I already own, but for now I prefer to keep the Stanley’s in the wrap them came with. 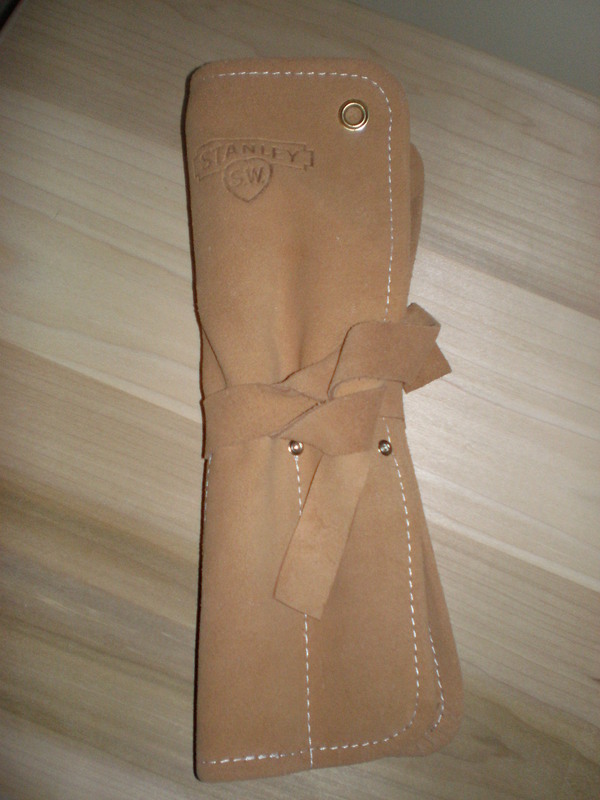 The Stanley wrap seems to fit the chisels much better, and the last thing I want is one of them falling out. This wrap is smaller in size as it only fits the set of (4)…this works for me right now as I am slowing loosing space in the shop. The overall feel of each chisel is fantastic. They feel well-balanced, and the shape of the handles fit nicely in my hand. All handles were loose when they arrived. I quick tap on a board or bench and they are locked in. 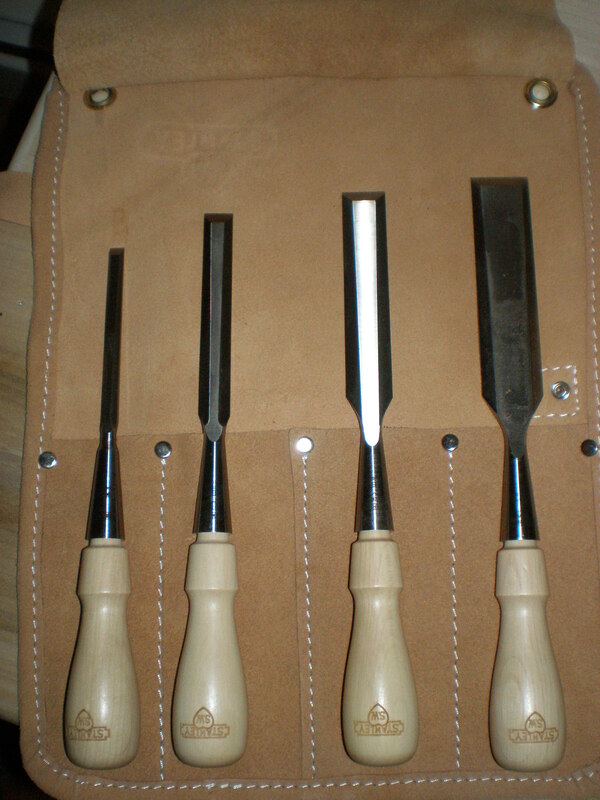 They were much lighter than I had expected, because my current set of chisels were quite heavy. I prefer these Stanley’s however, the light weight makes them feel like they are an extension of my hand rather than a tool in my hand. I tested them out immediately without doing anything to them, except for wiping the excess oil off of them. I went first to cutting some end grain…the ultimate test. Let me tell you, these cut end grain like butter. I could slice through the end grain with one hand and a minimal amount of pressure. They cut equally as well in long grain situations. I only hope that I can continue to sharpen these as well as they have arrived. They helped me to realize what a really sharp edge is, and that I need some work on sharpening. The back of these chisel were dead flat right out of the box as well. I tested them out on so me tenons that I was creating. They were flawless again…cleaning up the tenons with ease. I also tried the chisels out making relief cuts for x-cutting (second or third class cut). They cut with so much control because they are so sharp. From this point on my sawing will much improve. All in all, these are a great set of chisels. I know in the future I will be purchasing other sizes as needed. You simply can’t go wrong with them…I couldn’t find one criticism. I highly recommend them. I have been using these out of the box now since the original post. Occasionally I have an issue with the handles coming loose. I thought about using the old hair spray trick, but in a pinch I just use good old saliva. Hopefully nobody will walk by the shop and see me licking my chisel sockets. I have also put these through a full shaping and honing session. I started with the backs, which I had stated were flat right out of the box. I did very little work on the 1000 grit water stone on the backs. I then re-ground the primary bevel to match my sharpening set up appliance for future sharpening. Then I honed a secondary bevel. I put them back to work with no issues. I have been chopping mortises, securing scribe lines, and shaving tenons quite a bit and the edge retention is very good. Obviously, not as good right off the stone, but a good ‘working’ sharp. Just ask my left index finger, which has just finally healed. This entry was posted in hand tools, tool review, VCF, woodworking and tagged hand tools, stanley, tool review, woodworking by villagecustomfurniture. Bookmark the permalink.